Our roundup this week is packed with informative nuggets and insights, right from how Canadian merchants are using beacons to enhance customer experience by paying for parking, to how McDonald’s used beacons to push in-store conversion rate to 20%. So sit back, sip a cup of coffee and check out the stories we have lined up for you. McDonald’s recently sought to enhance personal relationships with customers as well as increase awareness of a new line of coffee-flavored beverages by leveraging a new proximity marketing strategy at 15 McD Cafés in Istanbul, Turkey. As a part of this program, McDonald’s tapped the Shopping Genie mobile app, a popular Turkish loyalty app, to target customers while they were around the premises of the local McD Café. The app pushed mobile coupons to customers prompting them to purchase one coffee and receive a beverage from the new drink line for free. 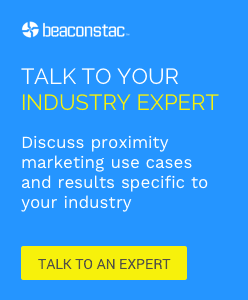 Check out this article to learn how beacons helped McDonald’s achieve 20% conversion rate with 30% of users who received the promotion using it more than once. Tillster, a company that provides software and other tools to enable self-ordering and checkout at big corporate restaurants such as Burger King, Taco Bell etc., recently leveraged beacons to narrow in on mobile payments for the many chain restaurants it serves. Earlier this year, Tillster had rolled out a feature that empowers customers, with the ability to pay for their meal, at their table via a mobile app without having to interact with the waiter. However, to make this service even more seamless, Tillster is now also looking to leverage beacons to alert restaurants as soon as customers walk through the door and take the appropriate next step before they even get to the table. Check out this article to learn how Tillster plans to make it big by focusing on enabling mobile payments in chain restaurants, rather than focusing on individual restaurants like beacon enabled payment apps such as Cover and Dash. Many local merchants such as Cora’s, Vogue Optical and Crown Plaza Hotel in Canadian cities have partnered with HotSpot, a mobile parking payment application to cover the bill for parking as a way to drive longer in-store visits and acquire new customers. With nearly 500 beacons deployed in garages and retail locations that support the program, HotSpot can easily determine where users have parked and also allows merchants to push offers to customers as they pass by. Some of the offers that businesses can offer to HotSpot users include free parking while they are shopping in a store, extra validation and protection from getting tickets. Check out this article to learn how HotSpot is helping drive 30% of drivers to stores that offer HotSpot parking perks. According to Javelin Strategy & Research’s new Mobile Proximity Payments Forecast 2015 report, while 9% of online transactions are currently made on smartphones, mobile proximity payments (payments made via smartphones at brick and mortar stores) account for just 1% of all retail transactions. Though this data might make the market seem very small, experts predict the proximity payments market to take off over the next few years. Check out this article to learn in detail about four payment services that are already using beacons to make it big in the proximity payments segment. The City of Sydney recently launched an iBeacon trial aimed at driving audience engagement with its new public artwork – Yininmadyemi – Thou didst let fall sculpture, a seven-metre high World War II sculpture honouring Aboriginal and Torres Strait Islander diggers. As a part of this beacon program, four beacons were installed around Hyde Park South, where the sculpture is situated to push notifications to users of the city’s Sydney Culture Walks App asking the if they are interested to listen to the story that inspired the artwork. The beacon trial will is currently scheduled to run for a span of 12 months, is a partnership between the City of Sydney, Meld Strategies, Brand Culture and Beaconmaker along with the Culture Walks App developer, We Make Apps. Based on the success of the trial, the City of Sydney plans to look to use beacons across other public artworks. Check out this article to learn how the City of Sydney plans to use beacon analytics to gauge the success of the trial.